You are here: Home / Mens Health / What Is Transurethral Needle Ablation (TUNA)? 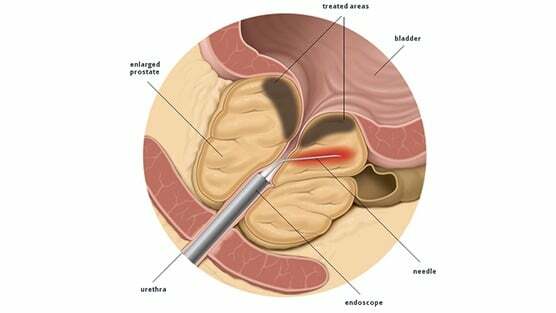 Transurethral needle ablation (TUNA) is a minimally invasive treatment for men with benign prostatic hyperplasia (BPH). TUNA delivers radio waves through needles positioned in the prostate gland, which heats and destroys the enlarged prostate tissue. This procedure takes about 30 to 45 minutes and may be performed as an outpatient procedure. TUNA Therapy is a nonsurgical treatment. You will be given a mild sedative to take orally, and local anesthesia is delivered to the prostate via a small catheter inserted into the urethra. Your physician will then insert the TUNA device, which delivers low-level radiofrequency energy directly into the prostate. This energy shrinks and destroys the prostate tissue. It then relieves the constriction on the urethra and improves the symptoms of BPH. After the procedure is complete, you will be given fluids to drink and will be asked to remain in the office until you urinate. In some cases your doctor may elect to insert a catheter to ensure your comfort. What Are The Advantages of TUNA? Every procedure or treatment has risks. Ask your healthcare provider how these risks apply to you and discuss any other questions or concerns that you may have. Several weeks or even several months may pass before you see any noticeable improvement. This is because your body needs time to break down and absorb prostate tissue that has been destroyed. Overall improvement of symptoms after 3 years is about 66%. In contrast to other modalities, studies have shown that men treated with TUNA only very rarely experience any ejaculatory dysfunction.